GLREA has launched an annual membership drive. For GLREA to carry out its mission of expanding renewable energy in Michigan, we need all supporters to become members. The dues will cover the 2018 year. Do you want to stay connected and informed about renewable energy in Michigan? Do you want to help support our advocacy and education efforts? Sign up at http://www.2glrea.org/membership. New officers were elected at the January board meeting. Dave Konkle was reelected as President. He recently has moved to Ann Arbor so there is a solar home in Grass Lake up for sale. Email konkle@toast.net for further information. John Sarver was reelected Secretary and Cary Church was reelected Treasurer. We have a new Vice-President, Mark Clevey. Ann Arbor has passed a resolution to power 100 percent of the city’s municipal government operations with renewable energy by 2035. The City Council unanimously approved the resolution in December, directing the city administrator to provide an action plan by September 2018 with five-year target objectives. City government operations for building electricity, heating and vehicles require about 283,000 MMBTUs of energy per year, the potential electricity equivalent of 85,000 MWHs or about 71 MW of solar capacity. More details. Ann Arbor Downtown Development Authority installed the first 18 electric car charging stations for public use at six downtown parking locations 6 years ago. Since then, 5 more have been added, and the 23 chargers have delivered enough electricity to displace more than 1 million miles of gasoline-fueled travel, according to Dave Konkle, the DDA’s energy consultant. The DDA is getting ready to install a solar carport by the chargers at the Fourth and Catherine lot as a demonstration project before the DDA considers adding solar panels at other parking facilities. More details. Southmoor Golf Club in Burton has received Planning Commission approval to change 37 acres of the roughly 95 acre grounds from general commercial to light industrial, which could clear the way for a commercial medical marijuana site, including multiple grow houses, processing center and a 3.5 MW biomass power plant that uses agricultural waste. Carbon dioxide from the plant would be fed back into the grow facilities. More details. SkySpecs, an Ann Arbor company that uses automated drones to inspect wind turbines, recently landed $8 million in financing that will allow the company to expand globally and add to its product line. The company began inspections in April of 2017 and has completed 3,600 turbine inspections at more than 70 wind farms in the U.S. and Europe. More details. Escanaba City Council has approved its electric department seeking bids for a 1 MW solar garden. Escanaba is considering leasing 5-7 acres at the Delta County Airport for the solar array. Once final costs are determined and the project is underway, the city plans to offer residential and commercial customers an opportunity to invest in the PV system and receive credits on their electric bills. More details. Public Building Operators who attend building operator certification (BOC) classes can get a $400 discount from the Michigan Agency for Energy. Classes have been scheduled in the Grand Rapids, Saginaw, and Lansing areas, with another slated for Detroit later in the year. Facilities operated by BOC graduates have been proven to have lower energy bills and improved comfort for occupants. Find more information about classes here. Smart 50 Awards, in partnership with Smart Cities Connect, Smart Cities Connect Foundation, and US Ignite, annually recognize global smart cities projects, honoring the most innovative and influential work. 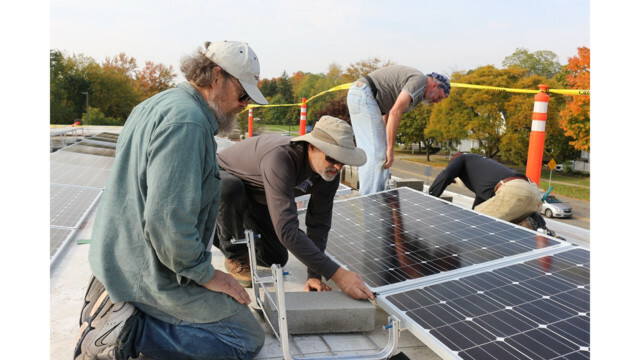 This year, Ypsilanti Fire Station Solar Installation has won a community award. See photo above. More details. President Trump has agreed to a recommendation by the International Trade Commission (ITC) to grant U.S. solar manufacturers relief from unfair trade practices in the form of tariffs on solar cells and modules imported to the U.S. That relief includes tariffs of: 30 percent in first year, 25 percent in second year, 20 percent in third year, and 15 percent in fourth year. The first 2.5 GW of imported cells are excluded from the additional tariff. The decision is the result of a petition filed by Suniva last year asking the ITC to investigate whether increased solar cell and module imports caused serious injury to the U.S. industry. SolarWorld later joined the petition. The ITC ruled in September that the companies had been injured and issued a recommendation for relief in October. More details. Federal Energy Regulatory Commission (FERC) has rejected Energy Secretary Rick Perry’s plan to rewrite energy market regulations to favor the coal industry in the name of grid reliability. FERC has issued an order terminating the proceeding it set up to review DOE’s notice of proposed rulemaking. The proposal, filed in late September, united oil and gas industries with wind, solar and clean power advocates in opposition to its plan to provide cost recovery to power plants with at least 90 days supply of fuel on hand — something that only applies to coal and nuclear plants. More details. Future of Natural Gas Peaker Plants is at risk because of falling solar and energy storage prices according to analysis by GTM Research. It is expected that natural gas peakers will become increasingly rare over the next few years, with the possibility that no new peaker plants could be built in the U.S. after 2025. This represents a 10-gigawatt market opportunity for solar paired with storage. In California, proposals are already in the works to replace multiple peaker plants with energy storage. More details. Toyota plans to commercialize solid-state electric vehicle batteries by the early 2020s. If the Japanese automaker can pull that off, it could leap ahead of the competition in terms of energy density, range and safety. Nobody has started mass manufacturing solid-state rechargeable batteries yet, but Toyota has assembled considerable resources behind that goal. More details. Lawrence Berkeley National Lab study has found that 92% of wind project neighbors have a positive or neutral attitude toward wind turbines. Over 1.3 million US homes are located within five miles of a large wind turbine. The study was the first nationwide survey to learn how those people felt about their local wind project. More details. Minnesota will be included in a study to help federal researchers test the potential of pollinator-friendly habitat and fruit and vegetable crops around solar arrays. National Renewable Energy Laboratory (NREL) will plant vegetation this year at three Minnesota solar installations owned by Enel Green Power. The sites are among 15 around the country that will be part of the research project. More details. Solar presentation at the Ypsilanti Food Cooperative will be held on Feb. 10, 12:00-1:00. Learn from Dave Strenski how solar power works. Ypsilanti Food Coop is at 312 N River St. Use the 308 door and head upstairs. Contact: Dave@Strenski.com. You can also learn about solar power in Ypsilanti by watching SolarYpsi.org/TEDxVideo.html. MPSC will hold its second conference on plug-in electric vehicles on Feb. 20 starting at 9:00 am. The discussion will focus on vehicle charging pilot programs and program impacts on infrastructure, utility rates and the electric grid. The technical conference will be at the MPSC’s Lansing offices at 7109 W. Saginaw Hwy. Questions should be directed to Al Freeman at freemana5@michigan.gov. For issue brief, click here. USGBC February Lunch & Tour- Creating a Sustainable High Performance Building will be held on Feb. 23, 11 am to 1 pm at the Coleman A. Young Municipal Center, 2 Woodward Ave. Learn about the challenges in creating a sustainable, high performance building with an older existing building. Register here. Next PACE Contractor Training will be on March 6, 8:00-12:00 at Velocity Center in Sterling Heights. While the Lean & Green Michigan trainings directly cater to contractors interested in the PACE market, they are also popular with property owners, lenders, real estate developers, and economic developers who want to learn about PACE. Register here. 4th Annual Catalyst Conference will be held by the Michigan Conservative Energy Forum on March 19, 8:30-1:30 at the Lansing Radisson. For more information, contact jlewis@micef.org. This newsletter is free. If you would like to subscribe, send a note to johnsarver3@gmail.com. Interested in getting information on energy programs and issues more frequently, visit our Facebook page and “follow” us. Interested in supporting renewable energy and becoming a GLREA member, you can join here.